Border Lion, a 9 year old son of Lion King, stands tall at 17 hands. But behind this regal form is a delicate, emotional animal. Cathy quickly determined that the bay gelding was telling her something. “He just wasn’t able to concentrate in the ring. He had difficulty engaging and collecting with his back legs. He was always talking back, resist- ing. He had even reared up on his previous rider,” Cathy explains. That’s when Cathy connected the dots. 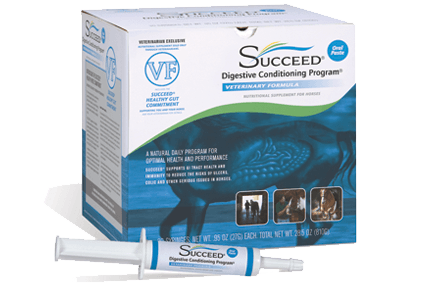 What Cathy discovered is that a horse’s digestive tract maintains a delicate balance. This can easily be altered by the challenges of modern performance horse care. 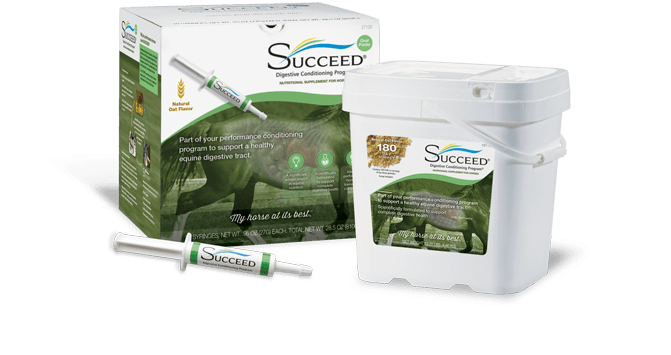 SUCCEED® Digestive Conditioning Program® is a unique, daily nutrient program that maintains the health of the entire digestive tract. And as Cathy has learned, that can directly affect the horse’s appearance, temperament and performance.